> > > every two instructions, especially when you have 32 registers. > > it doesn't seem to match anything in my experience. > > reduction is going to want one load per FLOP, while anything more likely wants two loads per FLOP. > > Or is the point that "memory operand per two instructions"
> > means one load and one op as the two instructions? > doesn't often go above 1:2. GPUs also have a low bytes/FLOP ratio of 1 or less. > be load port limited, I think the chance that Knights Landing only has one L1 load port is not negligible. > the cost of extra register file ports seems like a great compromise in this case. I assumed this was in the context of VECTOR FP code. I've no interest in the claim for general scalar code. Maynard Handley (name99.delete@this.name99.org) on January 6, 2014 6:56 pm wrote: > Nicolas Capens (nicolas.capens.delete@this.gmail.com) on January 6, 2014 9:18 am wrote: > > Maynard Handley (name99.delete@this.name99.org) on January 5, 2014 11:33 pm wrote: > > > Nicolas Capens (nicolas.capens.delete@this.gmail.com) on January 5, 2014 12:18 pm wrote: > > > > > > > Because typical code only requires one (unique) memory source operand > > > > every two instructions, especially when you have 32 registers. > > > > > > > > > > Where does this claim come from? I'm not denying it, but > > > it doesn't seem to match anything in my experience. > > > Maybe very dense blocked matrix code (and FFTs, which are basically isomorphic to matrix code) but a simple > > > reduction is going to want one load per FLOP, while anything more likely wants two loads per FLOP. > > > > > > Or is the point that "memory operand per two instructions" > > > means one load and one op as the two instructions? > > > > No, I do mean one (unique) memory source operand per two arithmetic operations, on average. The claim comes > > from over a decade of experience looking at x86 assembly but also from the observation that architectures > > typically have a 1:2 ratio of load ports to arithmetic ports or less. Silvermont has 1:2, Haswell has 2:4, > > and Core 2 and Nehalem had 1:3. Note that each of these have > > to deal with 32-bit x86 code with just 8 registers > > and thus many stack accesses, so with 32 registers for AVX-512 it's an even safer assumption that the ratio > > doesn't often go above 1:2. GPUs also have a low bytes/FLOP ratio of 1 or less. > > > > And yes, it's definitely possible to find examples of code which would be load port limited. But > > you can find examples like that for *any* resource so that's pretty meaningless. 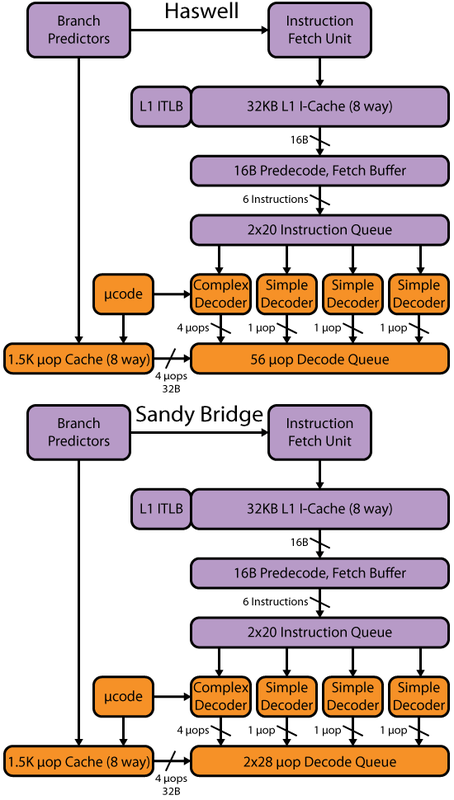 You should try > > to mix memory intensive code with arithmetic intensive code. It's all about the average code mix, > > and the relative cost of each of the resources. So despite the fact that a few algorithms could > > be load port limited, I think the chance that Knights Landing only has one L1 load port is not negligible. > > However an L0 cache to provide two effective load ports and lower the power consumption by avoiding > > the cost of extra register file ports seems like a great compromise in this case. > > I assumed this was in the context of VECTOR FP code. I've no interest in the claim for general scalar code.